Most Kenmore sewing machine parts, as far as what they do, are not much different than any other brand of sewing machine. Brother, Singer, Viking, White are all cheap sewing machines, not poorly made but inexpensive and very reasonable for the home sewer. The standard items such as bobbins, presser foot, tensions and such will be covered here. As for replacement parts you will need to contact a Sears store with the model and make of your particular machine. Then Kenmore brand has been a reliable one for many years and is owned by Sears. 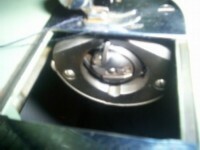 That means that the Kenmore sewing machine parts are good quality and will last for years. Also you will be able to find replacement much easier. Let's look at what some of these parts could be and their uses. We will start with the bobbin it is located under the presser foot on the base of the machine. The bobbin thread is what forms the stitches on the bottom of the fabric while sewing. You can see the top stitches on the side of the material that is facing you. This is produced from the thread on top of the machine. The bobbin is works on the other side supplying the thread for the stitches from beneath. The presser foot and dog feed is what holds the material in place while sewing. The presser foot hold the fabric down while the dog feed pushes it through at an even pace according to how fast you press the foot pedal. You lift the presser foot with the lever that is attached to the shank the needle sits in. The material is placed under the foot and the lever is lowered. While the fabric is passing under the foot, the needle is stitching. 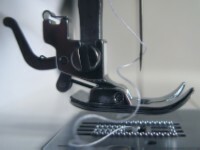 The needle brings down the tread from the top, passes through the fabric, catches the thread from the bobbin and pulls it up to complete a stitch. You have control to make it run and the speeds can be controlled by the foot pedal or knee press. Some even have speed controls that can be set automatically. Each model may vary in features from one machine to another to a degree but most Kenmore sewing machine parts do the same thing. Just some of the machine will be fancier and do more stitches than others. So you will have the check out the particular model you are interest in and all the features you may want included. 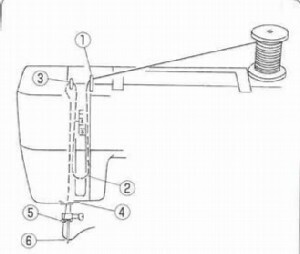 Another important control you will need to learn to adjust from time to time on any sewing machine, is the tension control. If the tension is too loose your stitches will not form tight enough and be sloppy, if the tension is too tight the stitches will pull and pucker the material. You may have to adjust the stitch controls from time to time because of the fabric you are using. The stitch size adjustment may be from long to short depending on what you are making. Also for a zig-zag stitch or other decorative stitches, you have to also set the width of the stitch. The other thing I must mention there are the various thread guides while, threading a sewing machine. 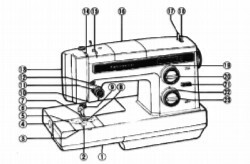 This is a basic sewing machine diagram for threading. Place the thread on its holder on my and run it through the various thread guides on the machine making sure to run around the tension control on the way. end up down at the thread guide right above the needle. (NOTE) If the sewing machine needles (the eye), is front to back you will put the thread in the front and pull out the back. If the needle eye is left to right, than the thread will go in from the left side and pull out the right side. This is standard for any brand machine. On the fancier models of machines you will have cams to insert to get decorative stitch patterns. This is helpful in embroidery and quilting projects just to mention a few. One great thing I like about the Sears Kenmore sewing machine parts is that its parts are made from quality material. This makes it lasts for a long time which makes it well worth the investment. Most of the old machines are still running with proper cleaning and oiling.